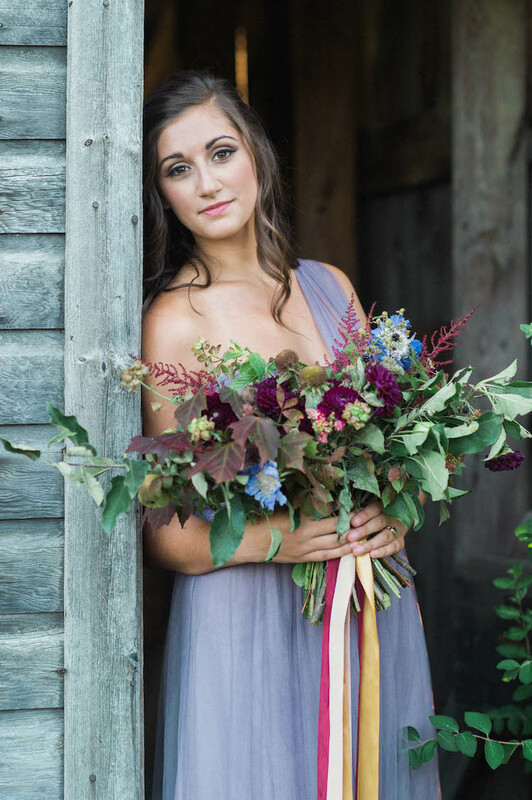 Picture yourself in a country-garden filled with lavender and purple blooms in the fall, the golden sun setting against a rustic barn and rolling hills. 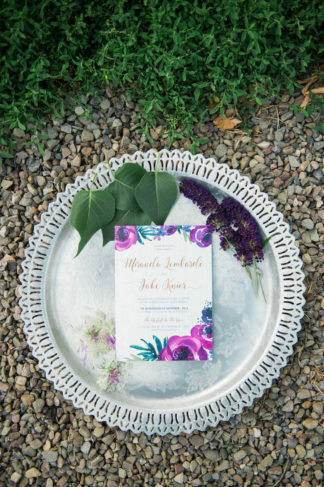 If this sounds like a hazy dream of desire to you, you’re going adore these purple and gold rustic chic wedding ideas, captured by Catherine Smeader Photography ! 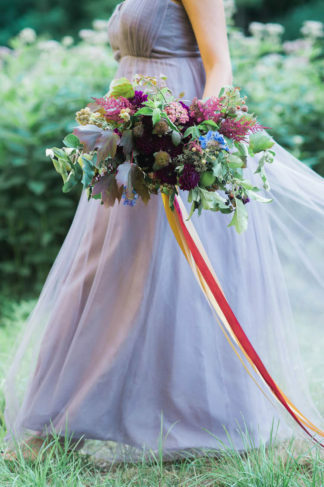 The scene includes a garden-style bouquet created by Wild Blossom Hollow, made up of a mix of local purple wedding flowers. 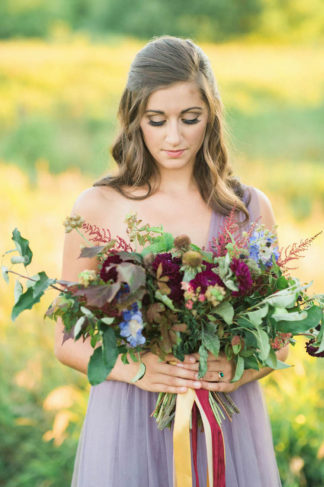 Think dahlias and chrysanthemums, as well as iris-colored florals as accents. 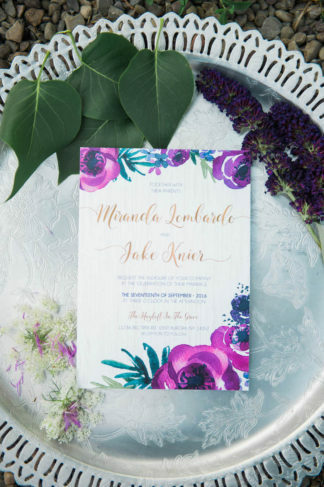 The painted floral invitation suit from Hoopla House Creative is drenched in shades of purple with gorgeous gold calligraphic elements. 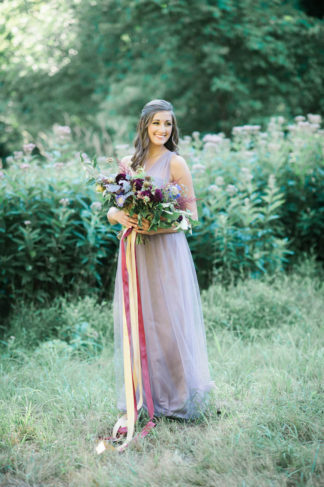 Hair and make up artists Nicole Thompson and Kara Boe complemented the smokey lilac Jenny Yoo dress with a natural look. 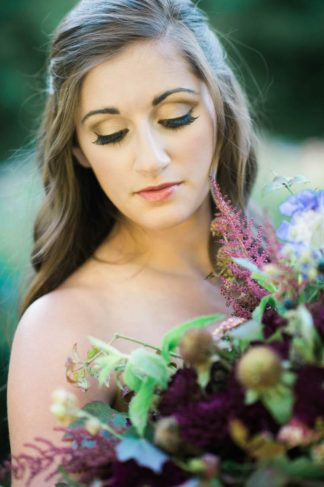 The addition of bold lashes and a fishtail braid added a pop of subtle magic. 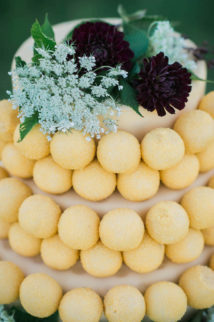 And a fun yellow cake from Buffalo Cake Pops added a touch of playful whimsy. LOVE! 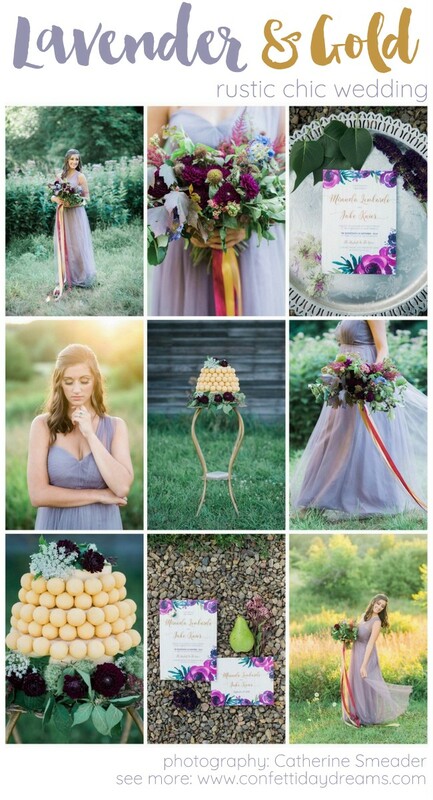 Would you like to recreate this swoonworthy purple and gold wedding look? 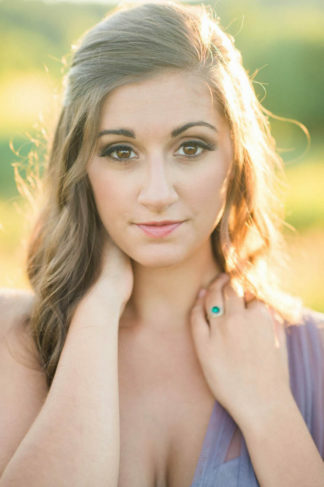 Catherine Smeader Photography shares how! 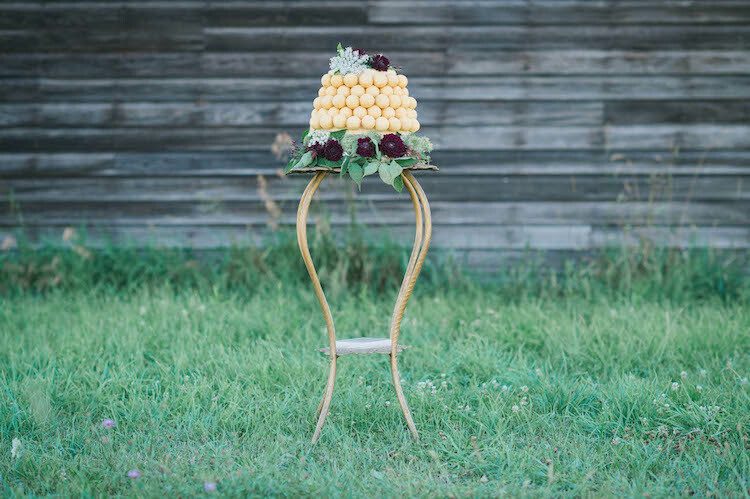 Look for a unique location that adds visual interest to your event. It does not have to be a typical location. 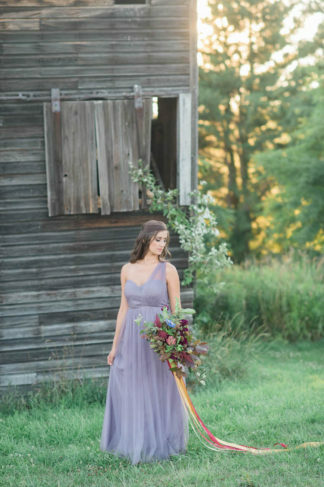 This particular location was on family property and was an old barn that used to hold grain. 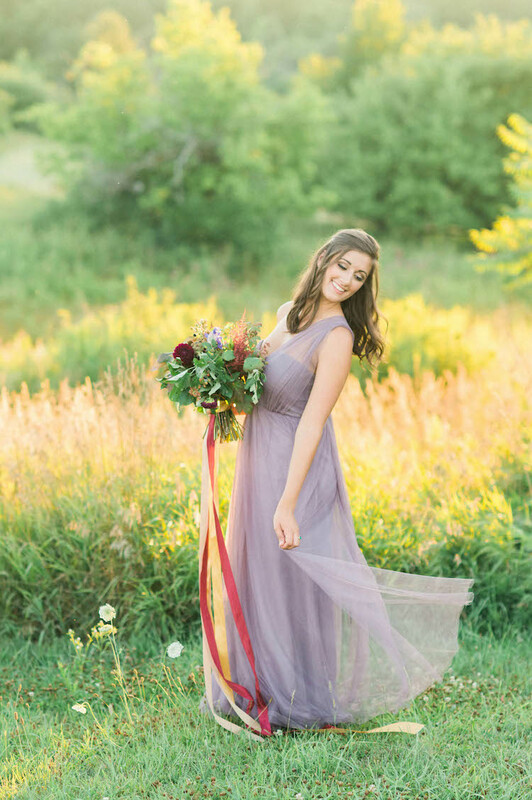 Add to that the rolling hills and the colors of the season, and it made for a beautiful location. 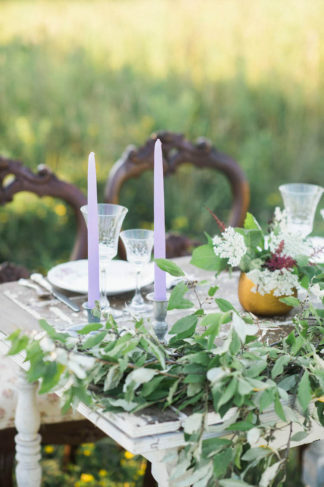 When dreaming up your tablescape, use lots of layers and different textures. 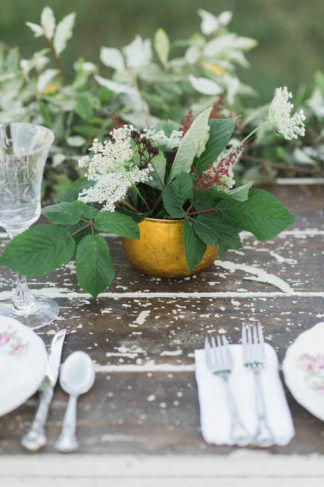 We used an antique table with china and crystal that were from my grandmother. 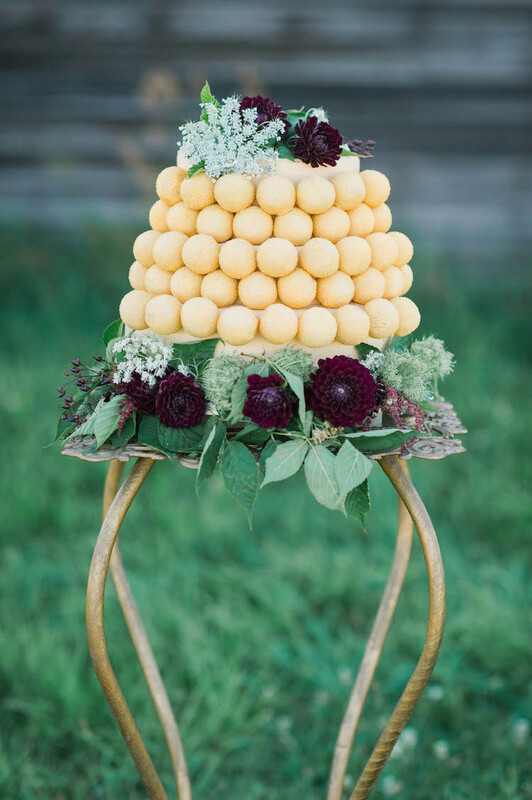 Combine that with lots of greenery and wild florals! 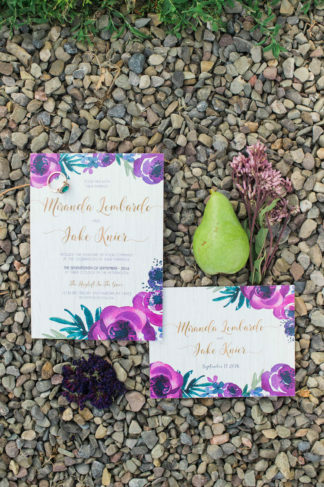 When playing with bold colors, choose a feature color with some accent supporting colors. 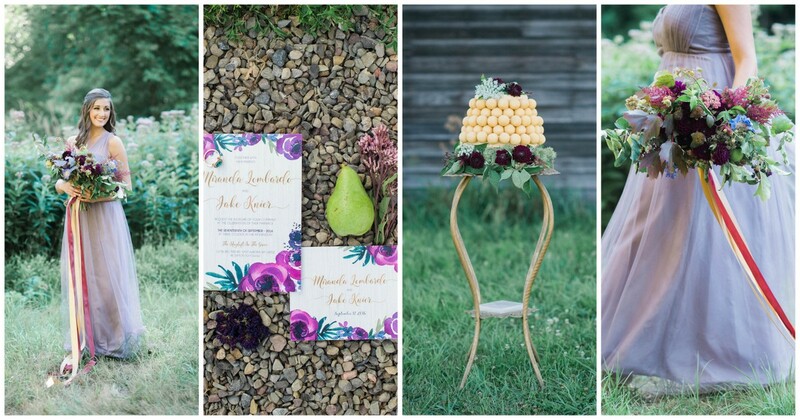 The main color in this shoot was lavender and we added burgundy, gold and greenery as accent colors that complimented without overwhelming the eye. 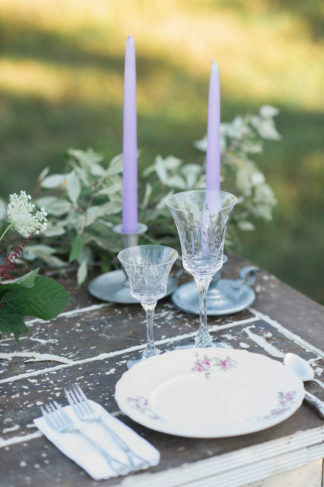 Check out this purple and gray DIY wedding filled with decor ideas! 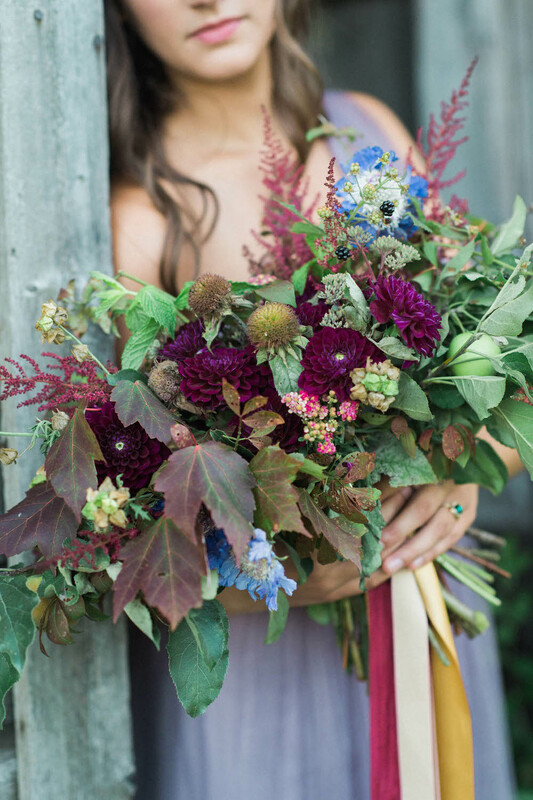 Dahlias are great for focal flowers a jeweled toned color palette, as can be seen in the above bouquet. 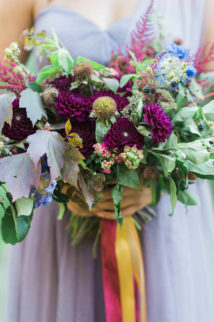 Dahlias are a true fall flower and mix well with the northern fall foliage as well as other fall flowers. 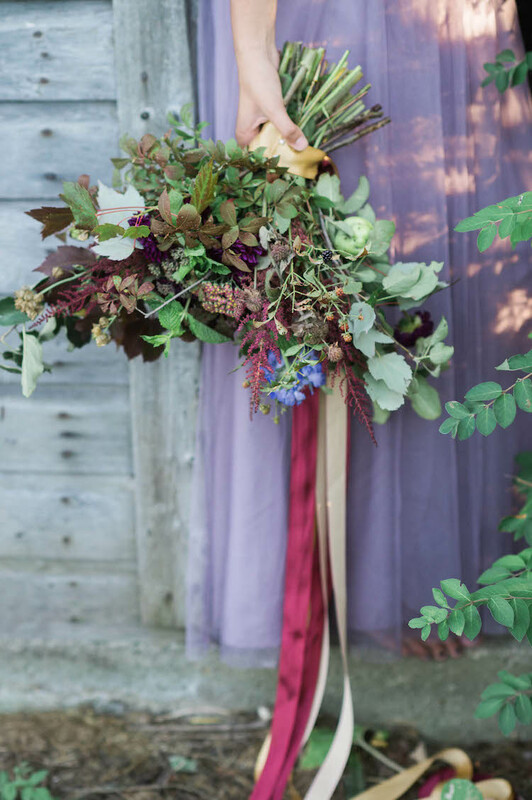 Include a mix of flowers, grasses and herbs. 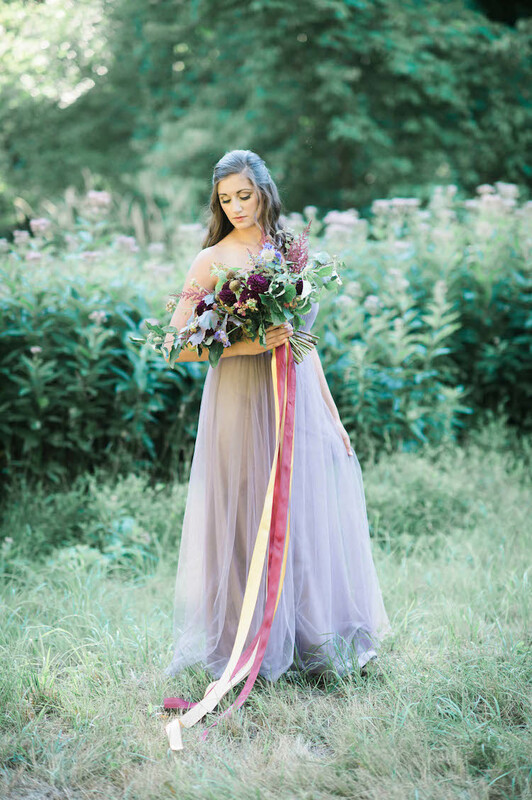 Here Wild Blossom Hollow used chrysanthemums, amaranthus, asters and many grasses and herbs. 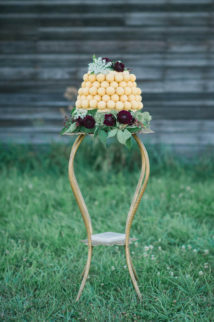 Stick to native florals which are naturally in bloom, this will truly add a garden/earthy style and feel to the design.